PETERBOROUGH – Runners faced freezing winter conditions for a half-marathon Sunday, but it was all for a good cause. Organizers with the Peterborough YMCA hoped to raise nearly $30,000 for the YMCA Strong Kids Campaign to help underprivileged children gain access to services they need. 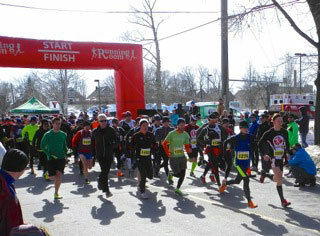 There were about 700 participants, said Jeff Crowe, who was serving as race director for the fifth year. “I’m a runner myself and I’m from Peterborough, so I like to give back to the community. And it’s nice to see such a great fundraiser with the Strong Kids program,” Crowe said. There was also a five-kilometre run/walk, and a one-kilometre fun run for children. Heather Stephens, who manages community outreach and youth programs at the YMCA, says it is by far the organization’s largest fundraiser, and for a very worthy cause. “The Strong Kids Campaign raises dollars to help underprivileged children and families who can’t afford lessons and day camps, so that they have an opportunity to enjoy the YMCA, and to enjoy being healthy and active in our community,” she said. This race brings competitors from all over the province, but it is by and large a community event, she said. Jesse Gibbs took first place for the men in the half-marathon, with a time of 1:12:31. Kasey Walsh came in first in the women’s division, with a time of 1:30:20.